Max Hall knows what it’s like to hit the highest highs and the lowest lows. 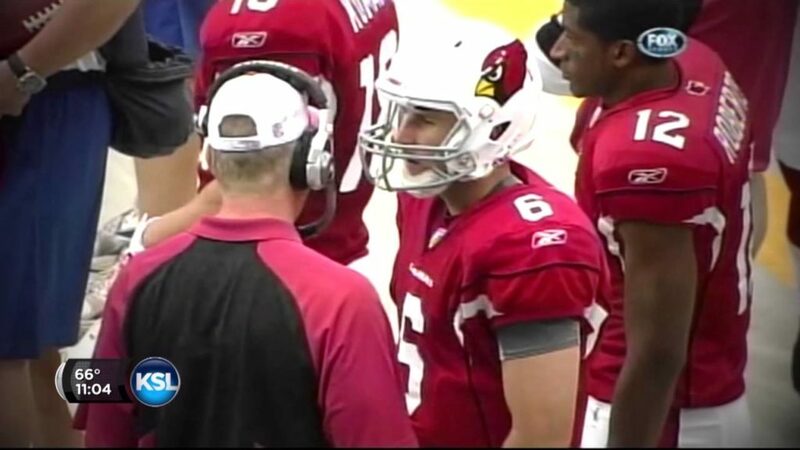 The former BYU quarterback from 2006 to 2009 went on to a pro football career with the NFL’s Arizona Cardinals and the CFL’s Winnipeg Blue Bombers until injuries forced him into early retirement. But that wasn’t the end of his story. Hall returned to his native Arizona, where he worked his way up through the high school coaching ranks and was an offensive coordinator at Gilbert High School. Hall’s much-publicized arrest for shoplifting and felony drug possession as well as subsequent firing from the school district made national headlines, as did the time he adamantly came out against rival Utah and its fans following a rivalry win in his senior season. “Yeah, it was embarrassing, and yeah people will judge me for it. But that’s OK,” Hall told KSL Sports in a one-on-one interview following a session with QB Elite in Sandy. “I want to use my story to help others who are going through the same thing. Hall knows that his story isn’t singular, even in Utah. A former missionary for The Church of Jesus Christ of Latter-day Saints in Iowa, Hall has experience with the demands of church culture and a football career with injuries that pushed him towards a downward spiral of prescription drug abuse, narcotics and alcoholism. The nephew of former Dallas Cowboys quarterback Danny White, Hall originally signed with Arizona State before transferring to BYU after his mission and eventually replacing star quarterback John Beck. He went on to become the Cougars’ all-time winningest signal caller with 32 career victories, eclipsing the 29-win mark held by Ty Detmer for nearly two decades. His tenure in Provo included a victory over then-No. 3 Oklahoma in Arlington, Texas, one of the biggest upset wins in BYU program history that highlighted an 11-2 season in 2009 and culminated in a No. 12 national ranking and a win over No. 18 Oregon State in the Las Vegas Bowl. His pro career was brief in 2010, but he led the Cardinals to his first career as an NFL starter in a 30-20 win over the reigning Super Bowl champion New Orleans Saints. Hall completed 17 passes for 168 yards, and also had a game-winning “touchdown fumble” at the goal line, colliding in a helmet-to-helmet hit at the goal line before one of his linemen picked up the football and carried it across for a score. “I remember I got hit on the goal line, and Larry (Fitzgerald) was carrying me off the field. But I stayed in, and we won,” Hall said. “Man, it was fun — in front of a home crowd to beat the Saints. The mistake I made was continuing to play the next few games. In the next week, I suffered another concussion against Seattle. Hall suffered a shoulder injury later that season, a turn that eventually ended his NFL career. It also amped up his addiction to opiates. “Having access to pain medication was a slippery slope to start going down,” Hall said. “Really, it ended my NFL career. It can happen to anybody. Addiction doesn’t care who you are or what you do. But there is help available. Don’t be afraid to ask for help; just take that first step. Hall took stronger and stronger pain-killing medication — think OxyContin — until they progressed into stronger, more addictive substances and alcohol. “You have physical withdrawal from it,” he said. “After you have been using it for a while, and you try to stop, you just want to get more. It becomes more and more, and then you are introduced to the wrong people and other substances. Hall managed the pain, and even cleaned up briefly when he returned to BYU as an offensive assistant in 2012. The chance to play pro football again came in 2013, when he signed a contract with Winnipeg. “When I got back from the CFL, I had a couple of bad relapses which ended me and put my mug shot on the front page of the newspaper,” Hall said. Hall was arrested for shoplifting and suspicion of cocaine possession at a Best Buy in Gilbert, Arizona. News of his arrest spread virally, as did his mug shot in a BYU practice t-shirt. When officers handcuffed Hall and put him in a police car for transport to the local police department, he knew he needed help. “That was a tough pill to swallow,” Hall said. “But looking back on it, it was a blessing. I don’t know if I would’ve stopped without that, without my secret being exposed. I knew this was a huge problem, and I needed some help. Hall’s treatment involved several factors, including an emotional acceptance of his problems — especially off the field. “My football playing days were over, and that was really hard for me,” he said. “I couldn’t watch a football game for a while — I couldn’t watch an NFL game. It was really hard for me; I’d get upset.